Do you want to dyno Quarter Midgets and Jr. Dragster engines? Let’s talk. 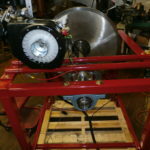 Stan Hewitt’s Patented Inertia Dyno & Dynamometer is the best and most accurate small engine dyno on the market. 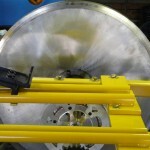 We have over 200 inertia dynos in U.S., Canada, Australia, & New Zealand. We’ve worked with hundreds of engine builders, shops, schools, and professionals in several industries to provide a custom solution. What can you do with a Hewitt Inertia Dyno? See acceleration in engine rpm increments (50, 75,100). See where acceleration falls of or slows down. Or see a range of data, (5400 to 6700). Test which change makes engine accelerate faster over range you use on race track? You can see total time in seconds of any rpm range in .001 and compare to other dyno pull side by side. See what changes made engine accelerate faster over certain rpm range? Graph S.A.E. corrected torque (tq) and horsepower (hp) in relation to engine rpm. Up to six graph dyno pull overlays/comparisons. View and zoom on any part of torque or horsepower graphs and see data (tq & hp) in 1/100ths of an increment at any rpm (including graph overlays). Compare any dyno pull to any previous dyno pull. Zoom in on any graph data down to 30 rpm engine increments. You can see S.A.E. Correction number instantly along with date and time along with peak tq & hp in relation to what rpm these occurred. View tq & hp numbers in relation to engine rpm in report (Excel) form instantly, including all sensors (temp, air/fuel ratio). Print anything you can see on graph or reports. See clutch dyno pulls and up to six overlays graphs at a time and print. Show clutch dyno pulls in relation to time (seconds), how long before clutch actually locks-up? AIR/FUEL RATIO (optional) -used on the old 4 channel or any of the new data systems- see what air/fuel mixture (12.8 to 1) is at any engine rpm and how it affects torque/hp or acceleration. (2 or 4-cycle). I recommend “Pro” data system; otherwise you have only one channel of temp. ELECTRONIC BLOW-BY SENSOR-(optional) measure leak down, ring flutter, lose of compression, valve bounce in relation to engine rpm thru computer. Can measure up to 1000 hp in 3 different ranges in graph or report form. We also have fuel flow measurement available down to under 5 hp, thru electronics sensors. * The following is based on these assumptions; you bought “Pro” software with S.A.E. weather corrections and have at least one analog temperature channel (head, ex, oil/crankcase, coolant, carburetor inlet temp, etc) sensor. What is your minimum and maximum horsepower requirement? 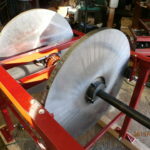 Needed to determine the Flywheel size – Example: 5 hp minimum & 30 hp maximum is probably the most common request. A dyno with a clutch on the engine or an axle clutch is somewhat forgiving because you can change the gear ratio from 10 to 1 down to 3 to 1. When you have an electric start dyno with synchronous belt drive, your window of cranking the engine RPM is narrower. We need the engine to crank at a high rpm but not to slow that it chugs. 2 cycle or 4 cycle motors? Note: If you’re doing mostly 2-cycles, you want to keep your flywheel smaller in O.D. but for most 4-cyclelow rpm engines, the flywheel size can be up to 31” in O.D. Keep in mind that we must never turn the “dyno” flywheel over 2500 rpm. The gear ratio will be a 6 to 1 on most 2-cycles and 4 to 1 on most 4-cycles. Dyno room entry door size– Determine or measure the inside width of your dyno room door or the building it is going into. This can be either 28” or 36” in width. I need to know this before I build your dyno. If it needs to be narrow this may raise the price slightly. 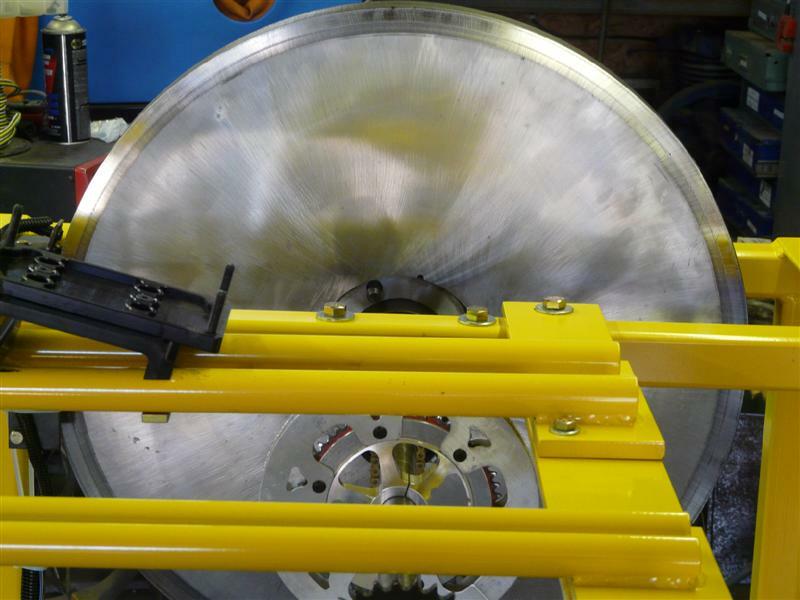 Determine Axle size & Bearing quality-We use 1 ¼” solid stress proof axles for most standard dynos up to approximately 27 hp. This uses heavy duty sprocket hubs which some karts shops stock. (We do not use low inertia light-weight sprocket hubs because they don’t last). If you’re using a clutch type dyno with #35 chain, I recommend that I install a steel hardened sprocket with internal QD hub for very long life. If you want a very low cost dyno, we have ISO 9001 Chinese bearings that have done fairly well. I prefer to use only NTN (Japanese) high quality bearings. On dynos 30 hp and above, I recommend 1 ¾” stress-proof axles and bearings which have larger balls in them and will make the dyno more accurate plus the bearings will have a longer life due to higher load capacity. We use a brand of synthetic grease that I recommend for all axle bearings. As of late 2011, I have gone to 2 bearings only on the axle; this makes the dyno even more sensitive to minute hp/torque changes. I highly recommend 1 ¾” axles & bearings! Determine your Table length – Do you want your dyno 36” or 48” long or do you need a custom length? Do you want a one-way sprag clutch which allows the Dyno flywheel tocoast if the engine should lock up? Do you want extra room for a possible second set of motor mount rails? (I do install (sprag clutches) in cases where engines are very expensive and the customer insists on it.) Otherwise I don’t recommend them since sprag clutches can give you unreliable acceleration data and are prone to mechanical break down if not correctly maintained. Do you want Electric Start – This will also add to the length of the table. If you have electric start, you will have a belt drive and still have the ability to dyno clutches, etc. YES, you can have electric start dynos with one-way sprag clutches. We use gear reduction GM starters on dynos up to 25 hp. We use diesel (Cummins) starters on everything over 25 hp that crank at much higher rpm, which is beneficial for animal engines and helps reduce belt breakage. Installing 24 volt makes them crank 60% faster yet, for the real exotic engines (Outlaw Jr. Dragster). 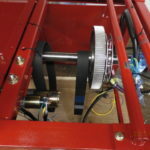 We have installed dual starters on dynos with huge flywheels or multi flywheels when a customer wants to dyno various engines ranging from 5 hp up to 125hp. We are happy to accommodate to yourindividual needs. Do you need more room for engine-mounting- Are you dynoing, for example Quarter Midgets and Jr. Dragster engines on one dyno? If so, we can add to the length of the axle in the engine drive area. 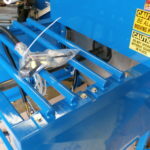 We standardize most parts so that if you have a parts failure, we can ship a part to you within a few days. Do you want Locking Pneumatic Swivel Casters with tubes- The Flywheel end of the dyno, has straight casters and the engine end of dyno, has swivel locking casters that lock the wheel brake when needed. This allows you to wheel your dyno around your shop, put it in the corner when not in use, and even take it to the race track! OPTIONAL-Stub Axle Ends- This is where we leave a 2” to 3” inch stub with correct keyway cut so you can add a second flywheel or two in the future or if you’re considering adding a chassis dyno table or axle dyno to this dyno? If you think you mayneed a larger dyno in future, I need to know that before building your initial dyno. Quarter midget options-This is where we add a motor mount rail system with a jackshaft to add an axle with bearings, so you can dyno gear box motors with a clutch. 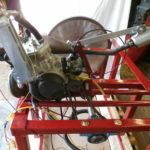 There are 3 different ways to dyno quarter midget motors, so ask if you have any questions. 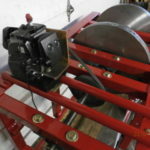 Use a jackshaft (#1) (cheapest) with a clutch, (#2) dyno directly off the splined end of crankshaft or (#3) use electric start with belt drive (which I recommend). By dynoing this way, you are also seeing drag or frictional losses in gear box assembly . DATA SYSTEMS- From time to time we have used original data systems. These systems communicate thru a 9 pin serial port, like all the early computers used, or on the newer computers you can get USB to serial port adapters (optional). All these systems will have the premium powered flywheel sensor, and at least one analog temp channel for head temp, etc. They all come with “Pro” software and have the ability to dyno clutches, torque converters, etc. You need to buy a digital weather station to manually do S.A.E. Weather correction which takes just seconds, or buy an optional USB to serial port adapter and modem to download directly into your computer. There are no new brain boxes or analog converters available for this data system. We use parts from trade-in systems to accommodate you. Do you want a USB 4 CHANNEL “PRO” SYSTEM-(HIGHLY RECOMENDED)- This system has 4 channels of temp, for example, you could have oil temp, head temp, exhaust temp and water temp and add air/fuel ratio & engine blow-by (optional price) with optional break out cable. This comes with “PRO” software. This system is fully expandable to 21 channels of data. This system also includes an inductive engine rpm clamp that just clips over the spark plug wire to read engine rpm. It includes S.A.E. Weather Correction internally and is done automatically. This system always includes “Pro” software. **NOTE: Lately (late 2012’), I been selling “Pro” data system with minimum temp (1 or 2) sensors and “NO” engine rpm wiring harness, inductive pick-up box or inductive pick-up eng rpm clamp. This is the cheapest way to get into “Pro” system and have ability to add Air/Fuel Ratio in future and add more temps’ sensors and add engine rpm system so you can dyno clutches in future! What AIR/FUEL RATIO(Lambda) would you like– This allows you to measure the lean or rich mixture out of the exhaust system using an 18mm sensor in the muffler. You can see the condition in relation to the engine rpm. This also allows you to use different throttle shafts, butterflies, screws, air bleeds, or modifications to transfer or discharge nozzles, main jets, and what have you, to control the air/fuel ratio. This can only be added to “Pro” data system. Would you like an ELECTRONIC BLOW-BY METER– This meter allows you to measure losses due to ring flutter, valve float, lose of seal, etc through the electronic sensor that can measure up to 1000 hp, through 3 different rating or range systems? What COMPUTER/PRINTER would you like for your dyno- Always make sure your wiring isgrounded (you can test this with a small tool from any home improvement store) and use an 8 outlet surge protector to protect your computer & data system! (1) For a low cost start up, we offer a used off- lease, dual serial port desktop with Windows XP Pro with (sp3 update), small hard drive and minimum off 1 GB of ddr2 ram. (2) For a New Dyno, we recommend Acer 17.3” laptops with dual core computer, 4 GB ddr3 ram, large drive, 3 USB ports, with optical USB mouse. These are excellent laptops (rated #1 or #2 by Consumer Reports last 1or 2 years) that are usually under $500.00. HP or Compaq laptops don’t work because they use F1 & F2 for sales information and these are the two buttons we use to control the data system. (3) We can offer several choices in desktops with large LCD monitors, USB mouse. For Printers, I personally like Epson Products. I can quote a basic inkjet or multi function all-in-one machine. I stock low cost 10 ft. USB cables and 8 to 10 outlet surge protectors. Yes, you can use your own computer, but if it crashes right away, you will lose all data. If this occurs, I charge you to reset your whole data system. As always, in order to help you meet your needs, we think ahead and inform you of your options so that you may use and enjoy your dyno for years to come! Chose the Color of your Dyno- We can powder coat just about any color. If you need your dyno quickly, we use a safety yellow or bright red that’s being used often by my powder coater. If time is not an issue, we can do almost any color. Standard colors are red, blue, yellow, white, black, or green.